What is Panic Anxiety Disorder and Agoraphobia? My book, Angels Turn Their Backs, is about a teenage girl, Addy, who is suffering from panic-anxiety disorder and agoraphobia. I am very familiar with this emotional illness as I have suffered from it, as have some members of my family. There does seem to be a genetic predisposition to it in some families. Since I wrote Angels Turn Their Backs, I have heard from, and talked to, many young people who were - and are suffering from this disorder. So I am writing this blog for those brave young people - and for those who are trying to understand what this illness is about. Why am I telling you about my own experience with panic/anxiety and agoraphobia? Because I kept it a secret for a very long time. Because too many who have it, live with it secretly. We don’t keep many physical illnesses a secret anymore, but emotional or mental suffering still has many stigmas attached to it even in 2012. It’s time to end that. For many years, agoraphobia was described as being a fear of public places. But, in fact, it is often the off-shoot of anxiety/panic disorder. 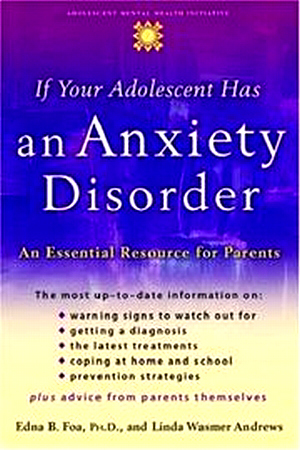 Panic/anxiety, leading to agoraphobia, often begins in adolescence and the early teen years, but can occur at any age. I was in my mid-twenties when panic attacks went into full gear for me, but I had always been a very anxious child and teen. More girls/women than boys/men seem to suffer from it. Often the real underlying causes of this emotional illness become so mixed-up and confused, that all that remains in the person’s mind is the fear of having another panic attack. All they want is for the panic attacks to go away. 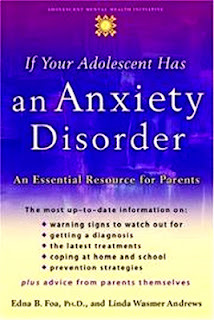 Sufferers might tell their parents and a few close family members about these fearful panic attacks, but they usually don’t discuss it with co-workers, school teachers, or most of their friends; generally, because of the shame and embarrassment associated with it – but also because mental/emotional illnesses still have social shame attached to them – and some people still tend to judge those who have this problem in a negative way. Even when young people tell their parents, or if adults tell their spouses or partners, they don’t always get the understanding and support they need right away. 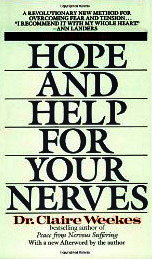 The problem is, often there appears to be “no reason” for the panic attacks to occur. They can begin after certain traumatic events, of course, but just as often, panic attacks seem to come out of nowhere – and the severe anxiety isn’t directed towards anything – it is just THERE. So if you can’t explain why you are having panic/anxiety to those closest to you, they may dismiss it (in their own worries about you) and claim you just “acting out”; or they may try to convince you that it will go away if you would only ignore it ... or that it is not as serious as you think it is. Nothing is more disheartening than to try to explain how you feel people to who don’t understand – especially when you, yourself, don’t understand why it is happening to you! “Pull up your socks” – an old saying that basically means, “Stop whining and get on with it!” can often be the first response of those you confide in. Of course, this only makes the situation more desperate for you. Most people close to you will eventually “get it” and help you to seek help; still others may be very supportive but yet feel helpless, or perhaps feel a kind of shame, or a belief that no child of theirs is “mentally ill" - and it may stop some them from seeking medical help for the you for quite a long time. Especially if they can’t afford professional help. But help is there. This illness is very treatable. The symptoms of a panic attack will often be triggered in a situation where escape is not possible or is difficult. It can be quite subtle. It may occur simply by going into a classroom, or an office at work; or as a simple example, -it may happen at a movie where you are stuffed into the middle row. There are many other other places where you may feel locked in and helpless. A panic attack can even occur just by you anticipating an event like going to school, a concert or a school dance. So often the sufferer stays home to avoid it. That is the beginning of agoraphobia. The panic attack you feel with agoraphobia, is like any severe panic attack. The symptom/reactions may include intense fear, pounding or racing heart, shaking hands, sweating, dizziness, fear of throwing up, gulping, finding it hard to breathe, a feeling of disorientation, and sometimes diarrhea or nausea. You may also feel as if there is a band tightening around your head. And to repeat, panic attacks that seem relentless might cause you to avoid certain situations where you feel you could be “locked in” socially. This can lead to avoiding school, or work, and other social situations – even shopping or going for a walk alone (in case you faint or run down the street out of control – which will not happen by the way!). And in severe cases, it becomes harder and harder to go anywhere at all. It is no wonder that agoraphobia and panic disorder can lead to depression, another offshoot of the illness. It might help and reassure you to know there are many myths that tend to circulate around panic attacks and agoraphobia. It’s VERY important to understand some of these “myths” when learning about this illness. Myth 1 - Panic attacks can make you go “crazy” and lose control of yourself. Not true. Be reassured. This will not happen. Even though panic attacks can be very scary, they will NOT make you go crazy. You may have many frightening thoughts and weird physical reactions while it’s happening, but you must always remember this. You are not crazy – and you are not going crazy. You will not go berserk and embarrass yourself publicly. In fact, most people with this problem actually become more controlled, not less, so that even their intimate friends and family don't even suspect their condition until they are told about it! The physical symptoms you are feeling are a reaction to the fear you are feeling. With help, you can learn to ride through them. Myth 2 - Panic attacks are a sign of weakness and a lack of control over your emotions. Not true. It is not your fault you are having panic attacks. It is an emotional illness and is recognized as such by all mental health professionals. Just the words “mental health” scares people. But mental/emotional illnesses are no different than any other illness. Like diabetes. There is no known cause of panic disorder. It seems that often a series of triggers are involved. But you CAN learn to live with it, control it.Most people do get well again. Once you understand this, it will help you to come to terms with it by learning to recognize that this is an illness that can be helped – once you learn to understand it and control it with guidance from a skilled councillor. People with panic attacks believe very strongly that the "attacks" they are experiencing mean that something physically harmful is happening to them. There are many frightening symptoms that can occur while having a panic attack. As I say above, these can include an accelerated heart rate, trembling, shaking and sweating. Not being able to take a deep breath, called shortness of breath, is also very common. It can sometimes make you feel lightheaded and nauseated. You may get a headache also. None of these things are life-threatening, according to the experts. And I know this to be true from experience. Many people who have panic attacks are sure that the shortness of breath will make them faint. But it is extremely rare. Myth 4: I will never get over the panic attacks. There is no help for panic disorder. This is a highly treatable illness. With the right treatment, you will be able to learn to control your panic. It is very possible to effectively manage your symptoms through one or more treatment option. But you need to get expert help. However, sometimes just knowing you’re not alone – that many people have this problem - and that you are not going crazy will help a LOT! Myth 5 - If I use self-medications like alcohol or the illegal drugs, the panic may go away. This is absolutely not true. This is referred to as “maladaptive” behaviours which can cause many more problems in your life. Things like alcohol may mask the fear for a few hours, but when the effects of the alcohol wear off your panic attacks may come back three-fold. And you’ll need more and more alcohol and then your life and health truly will be threatened. The same goes for illegal or recreational drugs. Your doctor may give you anti-anxiety medication, just while you are coming to grips with the illness, but eventually many people with panic-anxiety disorder learn to get along without any chemical help at all. You are not alone. My character Addy realizes this eventually. You will, too. But life is not a fiction story, is it? Life is something that is very tough and frightening at times. But you will get better with the right help. Knowing I was not alone – that others had these same feelings - was a huge help for me. I hope this has helped you understand a bit more what this illness you are suffering from is all about. You will get you life back! I've just ordered My Anxious Mind and will be reading it soon. The books above are can be found at Amazon and are also available in regular book form. You can order them from your local bookstores or online. The one book I relied on as a young adult suffering from panic anxiety was the one written by the wonderful Dr. Claire Weekes, one of the first people to write about how to cope with anxiety and panic disorder. It was the only book I could find at that time and I was so fortunate to find it in our library. Then I bought it! You can buy also Claire Weekes books and audio books online at Amazon. I have just received Angles Turn their Backs in the mail (yeah, ABEBooks!) and am no doubly wanting to read it... as soon as I finish the tome I am on (tomorrow!). Anxiety -- in whatever form it comes -- is SO crippling to young people, who are going through enough without such problems heaped on top. I really need to understand this more! 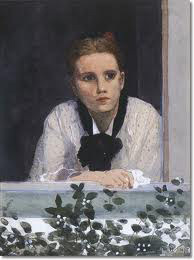 Karyn, I've added the wonderful Claire Weekes' book and some reviews for the other two. 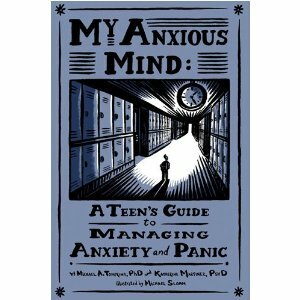 I just ordered "My Anxious Mind" on my Kindle, in hopes I can really endorse it for teens. Anxiety can be crippling for people of any age. Great post, Margaret! Thank you. You're welcome, Rebecca. If it helps just one person - young or older, I'll be happy.